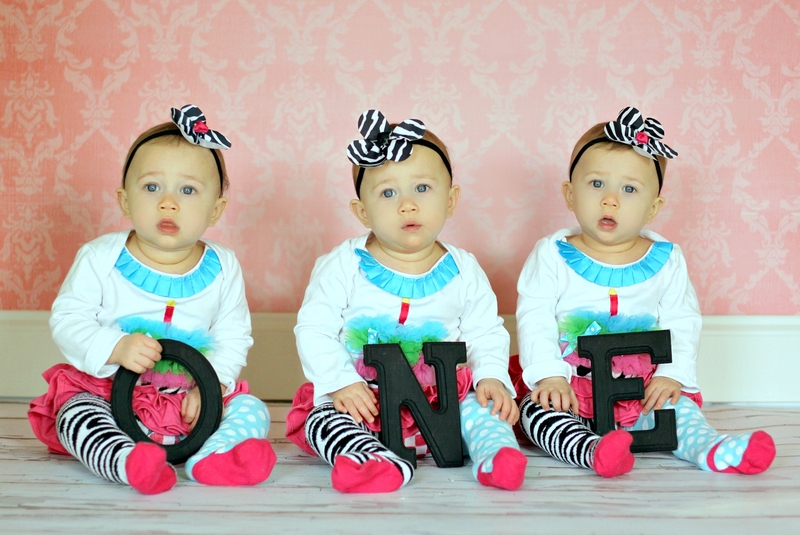 I can’t believe I am saying it, but the girls are ONE year old today! What a year and what a journey it has been. From the time we learned we were having triplets through the seven and half months I carried them it has been a journey filled with a lot of love, support, faith in God and yes, some tears and fears along the way. There were days where I think Bryan and I agreed that we may not make it through the day or that we could not handle one more sleepless night…but…we did. We made it. We survived. We are blessed with the loves of our lives. We celebrated their birthday this weekend with LOTS of family and friends. It was a great day. We know they will not remember it, but we will and we will remember why we chose to celebrate so big! One special thing we did do was ask our family and friends to consider donating a coat for a child in need instead of bringing gifts for the girls. We were overwhelmed that we have 49 coats to donate to an organization that helps foster children. Made our hearts feel so full. Thank you all. Avery, Camdyn & Emily – You are by far the best thing I have done in my life. You are sunshine each day. You make us smile even when we have had two hours of sleep. You are our laughter even when you have no idea you are being funny. You are truly our miracles. You arrived on February 12, 2011 at approximately 8:06 a.m., (Emily Ray weighing 2lbs, 11oz.) 8:07 a.m. (Camdyn Lea weighing 3 lbs, 2 oz.) and 8:08 a.m.(Avery Lynn weighing 3lbs, 7 oz). Nine weeks early at 30.3 days gestation. I lasted seven and half months and was on bed rest for six weeks! You spent 43 long….days in the NICU. We officially welcomed you home on March 25, 2011. You were already six weeks old. We see how big you have gotten now and its hard to imagine how tiny you were for the next coming months. Emily was literally the size of my hand it seemed like. You are beautiful big girls today. All the “shoulda” “could” and “maybes” that may have transpired throughout my pregnancy, after their birth and throughout their first year as preemies, we are in awe of God’s work in our girls and how perfect they are today. Babies: 3. And only 3 for those of you wondering our future plans! Sleepless Nights: Over the course of a year, the girls have literally slept through the night maybe six weeks. Out of the whole year! You do the math. Containers of Formula: Possibly more than 200 containers of formula. The girls were also on a hypoallergenic speciality formula for four months. We were grateful when we could switch and buy in bulk at Sam’s. Amount of money in insurance claims: More than $1 MILLION dollars! Of course, our portion was not that or we would be living on the streets. But, just to give you a glimpse as to what 43 days in the NICU looks like with three premature infants. Thank God for insurance. Avery – Has two teeth. Likes to shake her head NO. Took her first steps this week. She still falls down, but she is almost there! She is the most chatty too. Defiantly most congenial and the biggest drama queen. Camdyn – Standing on her own. Has two teeth just now popping up. Says, “Dada” and what sounds like “Dog.” LOVES splashing in the bathtub and laying down in the water on her tummy! Emily – Working on standing alone. Doesn’t stand for being bullied by Avery when she gets her monkey pacifier ripped out of her mouth. Loves to dance and bounce up and down to music. In conclusion, this has been an amazing year. As trying both physically and emotionally it has been, we absolutely feel blessed with our special miracles. We hear that year two gets a little easier. Bryan and I are so thankful for amazing people in our lives. We could not make this work without our families and our close friends. Thank you God for entrusting us with this wonderful trio. Give us the grace and strength to continue on leading our family down the path of health, happiness and glorifying you in all we do. So happy to be a part of their celebration! The girls are beautiful, and you and Brian do an amazing job at parenting! Happy 1st Birthday to an adorable trio! Such a significant milestone! I remember sitting at Nikolette’s talking about the babies (in your tummy) and how the first year would be so hard, but then things would start to feel more manageable. Now you’re there!